This walk focused on Charterhouse-on-Mendip as a multi-phased landscape. 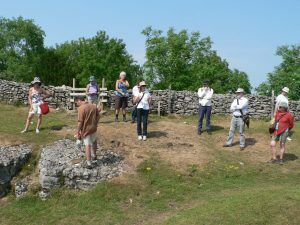 It started with a quick look at the Roman fortlet and a discussion of the current interpretations, that it was probably a stronghold for lead and silver, rather than a military fort. Next was a rather difficult walk to the Roman ‘rakes’ through dense undergrowth and then climbing over the stone wall that is the boundary between Ubley and Charterhouse parishes. The ‘rakes are deep, rocky gullies left behind from Roman mining as early as AD49. The ‘rakes’ follow the veins of lead that intrude into the limestone and have left the area looking like a mini-gorge. 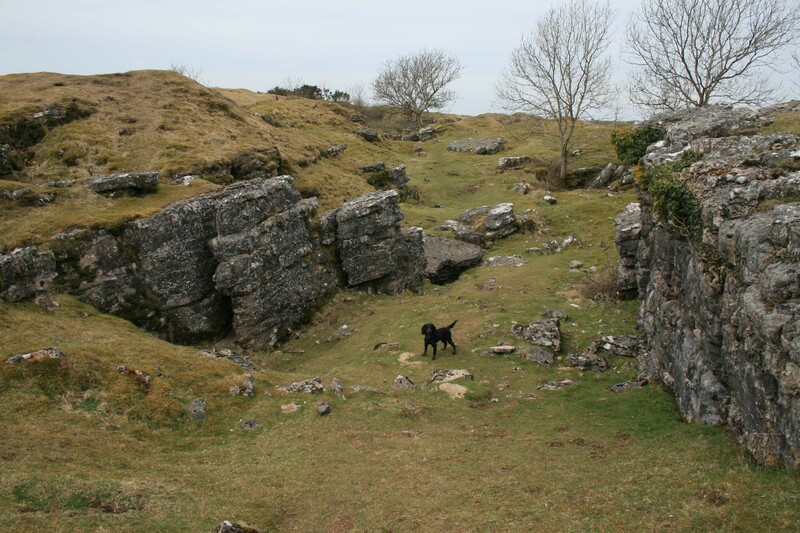 From there the walk went back across the parish boundary into the area where the Mendip Hills Mining Company in the 19th Century sank shafts in an attempt to find lead and silver at lower levels. The platform for the remains of a horse whim can be seen, together with a stone with a groove for the whim machinery. The Cornish miners had little success and were reduced to re-smelting the Roman waste deposits. Evidence of this can be seen in the ‘buddles’ (pools to separate out the lead ore from the waste) on the floor of Blackmoor and Velvet Bottom. The walk ended at the 1860 ‘flues’ where the waste from the smelting process crystallised out on the walls. These crystals were scraped off the walls and produced a highly toxic environment. Also visible in the landscape are Bronze Age barrows and a Post Medieval pillow mound (artificial rabbit warren). Shiny, black slag is evident through this landscape, which is one of the most extensively worked landscapes on the Mendip Hills. The parish boundary wall between Ubley and Charterhouse at the Rakes. The Rakes: the remains of the Roman mining at Charterhouse.